Playa d'en Bossa, Ibiza. 4-star superior hotel with modern spa right by the beach and within easy reach of historic Ibiza Town and the famous clubs. 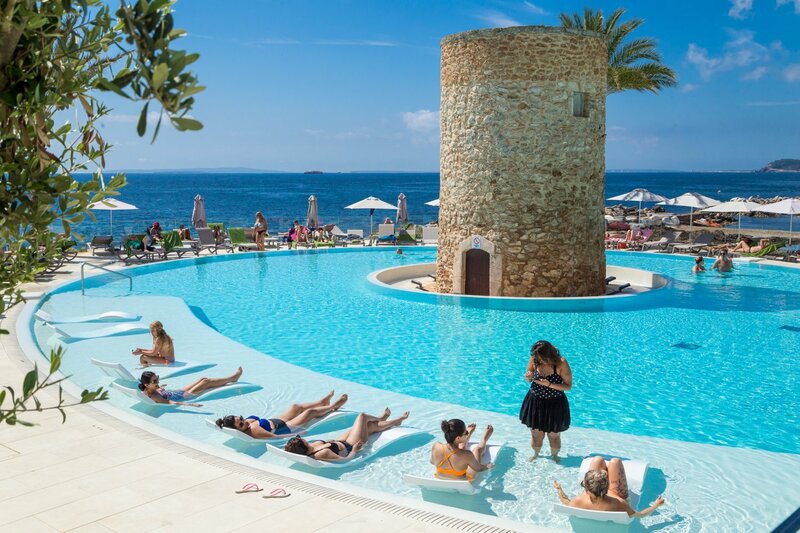 Torre del Mar Hotel - Modern style and a wealth of facilities combine in this luxury 4-star superior hotel, for the perfect Ibiza holiday. For pure relaxation, guests can lounge by the large pool around the watch tower, with sunken sunbeds and comfortable loungers all around. You can also chill out on the Excellence Terrace on the first floor with Balinese beds, Jacuzzi and panoramic views of the beach. The buffet restaurant has an outdoor terrace and spectacular views; snacks and meals are available all day in the gardenside restaurant bar. The chic, modern pool bar is just the place for a cool cocktail on a hot sunny day. The modern spa with lovely views of the sea offers a water circuit with all kinds of jet streams, multiple showers, a Turkish bath and a large sauna. You can also enjoy a massage and a range of health and beauty treatments. Decorated in muted Mediterranean colours that give a feeling of calmness and space, the rooms, that are also soundproofed, are a pleasure to stay in. The suites and penthouse accommodation offer lots of space including large terraces and luxury facilities for extra relaxation. The Torre del Mar's location between a beach resort and city gives you the option of either relaxing or a fun night out. Choose a chilled beach-type holiday on the edge of Playa d'en Bossa with lots of opportunities for water sports. Nightlife abounds in both of Ibiza Town and Playa d'en Bossa, where you will find super-clubs like Pacha and Ushuaia or lounge bars and beach clubs like Lio and Bora Bora. Read our review The shimmering oasis that is the Torre del Mar hotel and our article Torre del Mar hotel completes dazzling upgrade.